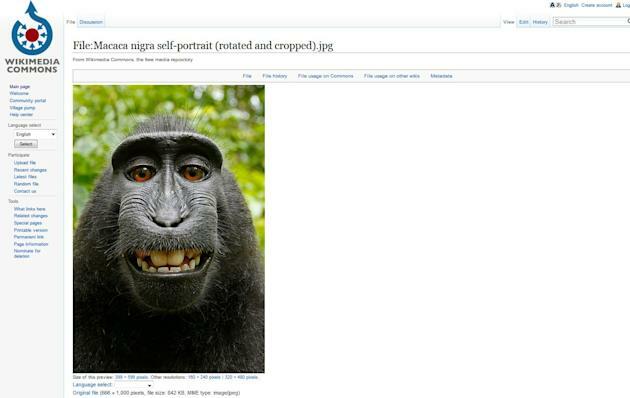 Guy walks into the jungle and has his camera swiped by a crested black macaque. The monkey, being a monkey, decides to have a little fun and takes a selfie. The photo winds up on Wikimedia Commons, where anyone can grab it for free. But the man who owns the camera wants it taken down, because he says the free downloads are eating into his income and he should have the copyright. It seems silly at first, but it actually poses a really interesting question. Professional photographer David Slater clearly has a vested interest in the case, the Telegraph reports. He claims he made the conditions for the photograph possible. But because the image is on Wikimedia Commons, a collection of pictures that are free for anyone to use, he isn't getting his just desserts. We don't think the Supreme Court has this one on its docket, so Yahoo News reached out to Joshua D. Cohen, an intellectual property attorney at Wendel, Rosen, Black & Dean LLP. He explained that a photo taken by an animal isn't subject to the same protections as a picture snapped by a human being. Simple as that. "You have to be a human being to get a copyright," Cohen said. "And while PETA might disagree, animal rights don't include copyrights." The Telegraph reports that Wikimedia concluded that "to claim copyright, the photographer would have had to make substantial contributions to the final image, and even then, they'd only have copyright for those alterations, not the underlying image. This means that there was no one on whom to bestow copyright, so the image falls into the public domain." Slater is reportedly continuing to fight to have the photo removed. Do you think Slater has a case, or is it best to let smiling monkeys lie? Let us know in the comments below.